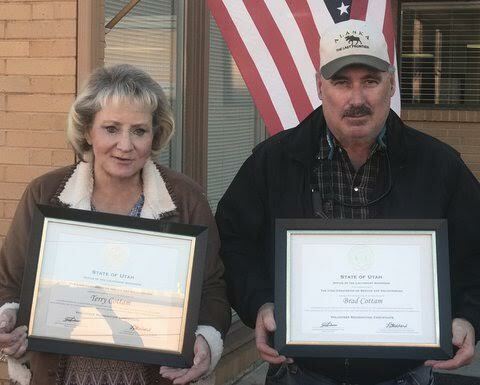 ST. GEORGE — Southern Utah residents Brad and Terry Cottam were recognized for their outstanding volunteer service to families dealing with dementia by Lt. Gov. Spencer Cox earlier this month. The couple was surprised with framed certificates at a recent Memory Matters Utah weekly caregiver support group meeting. Terry also started a grassroots fundraising effort for Memory Matters called “Dimes for Dementia” – then she upped the ante and renamed it “Dollars for Dementia.” The Cottams place coin jars at local businesses for patrons to donate coins and dollars to support Alzheimer’s and dementia programs and services. They have also recruited other caregivers to assist with the fundraising and encouraged fellow support group members to take the jars home and fill them with their pocket change. “Memory Matters Utah is a local nonprofit that depends greatly on volunteer service,” Lundquist said. “Because of the efforts of Brad and Terry, our reach is much greater and our clients have true friends who care and sacrifice to help them in their time of need. Memory Matters Utah/Nevada is nonprofit organization working to reduce isolation and improve wellness for individuals with dementia and their caregivers through activities, support, education and consultation. Learn more at Memory Matters’ website. Thank you for sharing this success story. Brad and Terry Cottam are greatly appreciated for the work that they do. I just love a story with a happy ending!